Mr. Sanders was admitted to The Riverside from Mount Sinai West on January 3, 2018. Prior to his stay at The Riverside, Mr. Sanders had his right toes amputated in October of 2017. The original treatment plan required a right transmetatarsal amputation with skin a graft in place. Following treatment at the hospital, there was no granulation tissue present, which resulted in slow and persistent bleeding. With little success in his current treatment, the medical staff advised Mr. Sanders that there was a need to proceed with a below the knee amputation. Anticipating amputation for the second time was extremely difficult for Mr. Sanders to handle; however, being that this was a life dependant situation, he chose to proceed with the surgery. Following the amputation, the medical staff at Mount Sinai West Hospital recommended a treatment plan of subacute rehabilitation 1-2 hours a day. 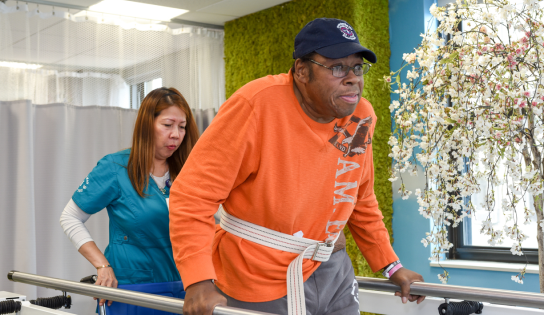 Mr. Sanders was given a choice of different subacute rehabilitation centers in New York City. He carefully looked at each center and ultimately chose the Riverside due to its Signature Amputee Walking School. After already undergoing two different amputations, Mr. Sander’s spirits were down; however, he was overjoyed to hear that two instructors Todd Schaffhauser and Dennis Oehler, three-time Paralympic Gold Medalists, would instruct, mentor, and guide him through this new challenging phase of his life. Upon arrival at the Riverside, Mr. Sanders was greeted by the staff members on his floor. Each department sent representatives to greet Mr.Sanders, answering his questions and inquiries. The concierge team greeted him with a welcome booklet and a gift. The concierge representative assured him that any issues or concerns would be handled quickly and efficiently. His personal concierge offered Mr. Sanders information about the Riverside’s Amputee Walking School. After just a few hours, Mr. Sanders was settled in and ready to continue his journey. With his new prosthesis he can finally practice walking again! Mr. Sanders shared some kind words for Todd and Dennis. “They stopped by every time they were in the building to check up on me, these two men are a true inspiration.” While in the gym, Todd and Dennis observed Mr. Sanders placing and wearing his prosthesis for the first time. Mr.Sanders will now begin working every day with his new prosthesis. He still has a road ahead of him, but thanks to Todd and Dennis, he feels confident that in time, he will be able to walk out of the Riverside standing tall and proud of his newest accomplishment!